Security agents guard property against theft and vandalism, control access to establishments, maintain order and enforce regulations at public events and within establishments. Security guards may be assigned to work indoors or outside. Working hours vary depending upon the employer’s needs and type of work. Security agents are often required to work nights, evenings, weekends or holidays, and can be assigned at several locations within a short period of time. Majority of security agents have a full time job, but part time and on call positions are also available. Duties often involve extended standing, walking, stair climbing, and exposure to inclement weather. The security agent works in uniform. 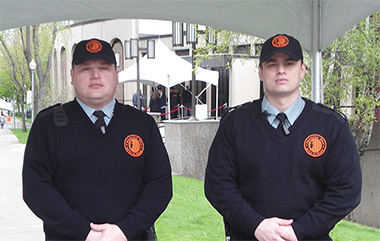 The minimum hourly rate and premiums for the security agents who work in Quebec are established by the Decree respecting security guards. The security industry plays an important role in the economy and this occupation offers a wide range of career opportunities and challenges. The industry is open to students looking for a part time job, individuals passionate about security who plan building a long-term career in this field, people in search for a second job to increase their monthly budget, individuals who change their career path, retirees who wish to return to the labour market, etc. The security related occupations are currently considered to be facing a balance outlook. Recent labour market conditions indicate no signs of pressures and the future conditions indicate a balance between job openings and job seekers. (source: Le marché du travail au Québec, Perspectives d’emploi par profession 2012-2016).